Looking for an amazing eye care experience in Cary? Come see us at The Eye Center located in the Cary Towne Center next to Lenscrafters! The Eye Center brings our leading eye care services and friendly care to Cary, NC. Located next to Lenscrafters in the Cary Towne Center, our office is convenient and easy to access. We are dedicated to providing you with a complete scope of ocular services. Our optometrists believe in a personal approach, and we aim to develop a unique relationship with each patient. In addition to treating your vision, we will inspect the health of your eyes, which also reflects much about your overall physical condition. With a warm and gentle manner, our expert optometrists conduct comprehensive eye exams for both adults and children at our Cary, NC, location of The Eye Center. Our comfortable and modern office is fully equipped with advanced technology that helps our optometrists to perform highly accurate visual screenings and diagnoses. With our eye on all the latest medical procedures and treatments, you are ensured first-rate care. Using Clarifye Technology and Optos Retinal Imaging, we can detect very early signs of glaucoma, macular degeneration and cataracts. We can also identify warnings for various health issues, such as diabetes, high cholesterol and hypertension. The Cary, NC, office joins our welcoming network of clinics located in Raleigh, Durham, Burlington, Wilmington and Fayetteville, NC. Our team of qualified and caring optometrists, Dr. Naheed Kassam, Dr. Mojgan Besharat, Dr. Glenn Middleton, Dr. Geeta Chowdhary, Dr. Thomas Walent, Dr. Shirin Esmail, Dr. Roba Bakir and Dr. Kevin Ritter, will be pleased to examine your eyes and treat you at a nearby location of The Eye Center. No matter what you need, from an ocular health exam to a contact lens fitting, please contact us for an appointment! Our optometrists will inspect your eyes carefully for any signs of eye disease, such as macular degeneration, diabetic retinopathy, cataracts and glaucoma. If you are diagnosed with any of these common eye diseases, we will help treat you in order to prevent future vision loss. 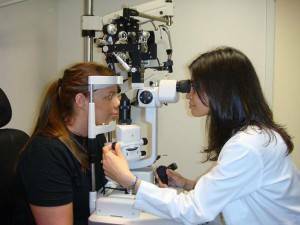 At our Cary, NC, clinic, we will conduct visual testing and evaluate the health of your eyes for any signs of disease. If you wear contact lenses, we will take this into special consideration. Regular eye assessments are particularly important for children, as they can identify any vision conditions that may cause learning delays. We have quality, modern technology so that your prescription is as accurate as can be. We offer a wide variety of quality, brand-name contact lenses in our Cary, NC, clinic. Our professional optometrists are trained in pre-operative and post-operative care for laser eye surgeries, including LASIK, cataract procedures and PRK. In addition to sharp vision, all components of healthy ocular function can be checked and analyzed by using the most advanced ophthalmic technology. The Eye Center in Cary, NC, is right beside Lenscrafters. We also offer five more convenient offices that serve the North Carolina neighborhoods of Fayetteville, Raleigh, Durham, Burlington, Chapel Hill, Wilmington and Greensboro.